After spending my adult life thinking I'm a mostly logical person (and being not so secretly proud of it), I just found out I'm not. And apparently the fact that I think I am is a little irrational. You might think I'd be a little sad to discover this but I'm actually thrilled. 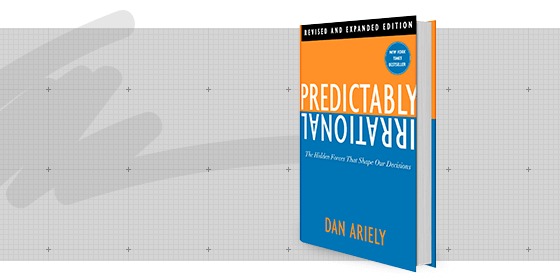 A whole new perspective on marketing just opened up because Dan Ariely told me we're all Predictably Irrational. Don't let behavioural economics scare you off. This book is insightful and funny, and a fairly quick read (because I couldn't put it down). I learned a marketing lesson in the first chapter that is so improbable... well, you'll have to see for yourself. It's powerful stuff and I recommend it highly.